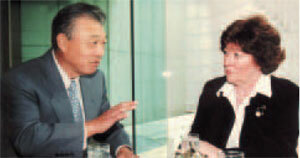 Ambassador Yohei Sasakawa met with newly appointed UN High Commissioner for Human Rights, Ms. Louise Arbour, in Tokyo on November 9, 2004. Ms. Arbour had served as a member of the Supreme Court of Canada and as chief prosecutor for the International Criminal Tribunal for the former Yugoslavia and Rwanda. She assumed her duties as high commissioner in July 2004, replacing Sergio de Viera Mello, killed in the bombing of UN headquarters in Baghdad in 2003. In her meeting with Ambassador Sasakawa Ms. Arbour expressed her deep concern over the issue of leprosy and human rights. She said discrimination is caused by ignorance and fear and that education and information would be the key to eliminating the problem. Japan's best-selling daily awarded its 11th Yomiuri International Cooperation Prize to WHO Goodwill Ambassador Yohei Sasakawa in October for his decades of work toward eliminating leprosy around the world and the discrimination it causes. The award was presented by Yomiuri Shimbun President Takuo Takihana. Previous recipients include Sadako Ogata, former UN High Commissioner for Refugees. The prize marks the newspaper's 120th anniversary. It is nice to read that the role of NGOs is very important (Issue No. 10, From the Editors). From my point of view not necessarily in picking up the slack when government priorities waver, but in collaboration with government services and treading where government is not yet reaching in terms of new initiatives and research. You mentioned that time was lost in the battle to eliminate leprosy in Brazil. If you took some time looking at the annual statistics, especially, for example, at detection rates or at rates of Grade 2 disability among new patients, you would realize that much has been achieved over the past years. If you were to analyze the situation state by state you would find out that some states have had excellent results and high cure rates. It is sad to observe that the good efforts of the thousands of dedicated government leprosy workers in Brazil have not been mentioned. Preserving the history of leprosy is the subject of our interview with Dr. Jo Robertson on pages 4-5. While the archive material that her project focuses on dates from 1800 onward, the first records of a leprosy-like disease trace back to 1400 BC. This is a disease that has given rise to human misery for over 3,000 years. Now, thanks to MDT and the concerted efforts that have been made around the world, leprosy is close to being eliminated as a public health problem in every country. The suffering and despair caused by leprosy, and what the disease tells us about man's inhumanity to man, should never be forgotten. But neither should the inspiring stories it has produced, not least of the individuals who have borne their affliction with courage and dignity in the face of despair. Then, too, there are the thousands who have worked hard and selflessly to care for and treat patients, as Pieter A.M. Schreuder reminds us in his letter. We must not forget. (c)2004 The Nippon Foundation. All rights reserved by the foundation. This document may, however, be freely reviewed, abstracted, reproduced or translated, in part or in whole, but not for sale or for use in conjunction with commercial purposes. The responsibility for facts and opinions in this publication rests exclusively with the editors and contributors, and their interpretations do not necessarily reflect the views or policy of the Goodwill Ambassador's Office.